It’s true — advanced English can be tough! You’ve learned all the grammar rules, and your vocab keeps on growing. But there’s still that feeling that you haven’t quite “nailed” the language. When learning a language, there are good times when you learn a lot and quickly. But there’s a problem with this graph: Those plateaus shouldn’t be flat. Although they feel flat, you’re still learning during them. You just don’t feel like you’re learning. And one of the big problems with advanced English is that you feel like this more and more. Even though you feel like you’re not learning, you are! There are a million things you can do to make yourself feel like you’re making progress. This second point is especially important. If you feel like you’re making progress, you’ll make more progress. It’s motivating! We actually met him back in April, when I showed you how to learn from a real English conversation. OK. Who’s this Pietro, and why should I care about what he has to say? Actually, he’s not literally you. You’re you, aren’t you? But Pietro has a lot in common with you. When I first met him, he was struggling with his English. He was at a high level, but didn’t feel that his English was very natural. I worked with him for a few weeks on Skype, showing him what he needed in order to speak English more naturally, and how to improve his confidence to develop his everyday English by himself. Pietro is now working as a researcher for a big company in Cambridge, England. He feels confident in his surroundings thanks to his natural English. He’s a classic English success story. So you should definitely listen to what he has to say. 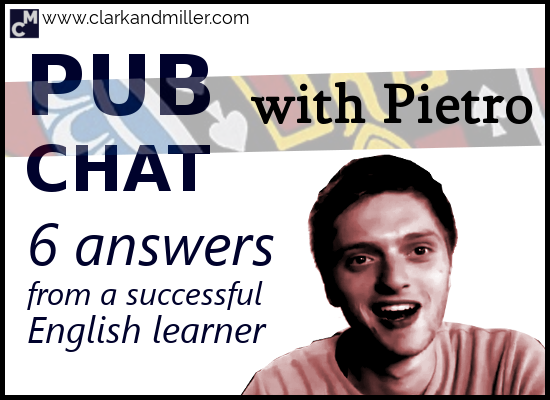 Last weekend I was in London and Pietro and I met up over a fantastic pub lunch in Soho, where I asked him about how he became such a successful language learner. Have you had a similar experience with your English? Would you have answered these questions differently? So let me know in the comments! Hi. It’s a pity that the background sound of the room makes listening comprehension a bit difficult. But it was worth it. Thank you a lot for your lessons. I guess you could look at it as a more “challenging” listening, and so much better for your listening comprehension skills!